Download "XXL ASA - Announcement of terms in the Initial Public Offering"
2 (i) an institutional offering, in which Offer Shares are being offered to investors subject to applicable exemptions from the prospectus requirements, and subject to a lower limit per application of NOK 2,000,000; and (ii) a retail offering, in which Offer Shares are being offered to the public in Norway, subject to a lower limit per application of NOK 10,500 and an upper limit per application of NOK 1,999,999 for each investor. (iii) an employee offering, in which Offer Shares are being offered to the Company s eligible employees, subject to a lower limit of NOK 15,000 and an upper limit per application of NOK 1,999,999, and in respect of which such eligible employees will receive a discount of NOK 1,500. 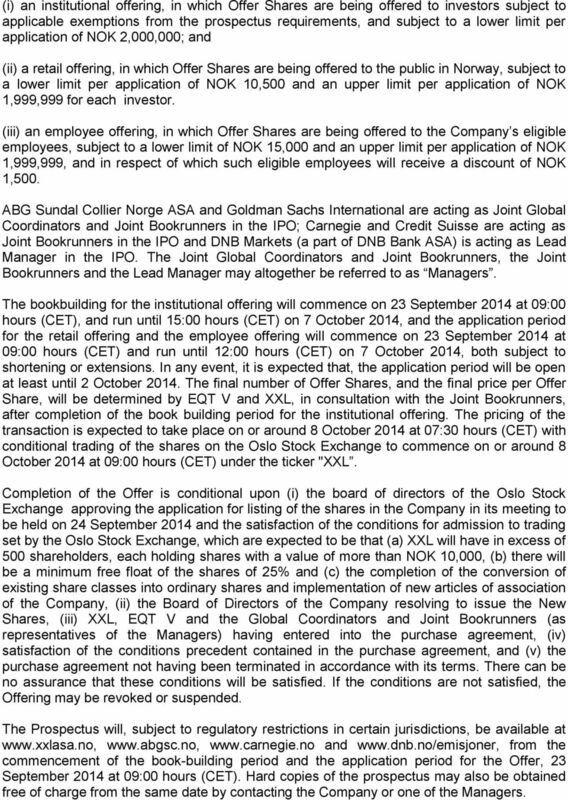 ABG Sundal Collier Norge ASA and Goldman Sachs International are acting as Joint Global Coordinators and Joint Bookrunners in the IPO; Carnegie and Credit Suisse are acting as Joint Bookrunners in the IPO and DNB Markets (a part of DNB Bank ASA) is acting as Lead Manager in the IPO. The Joint Global Coordinators and Joint Bookrunners, the Joint Bookrunners and the Lead Manager may altogether be referred to as Managers. The bookbuilding for the institutional offering will commence on 23 September 2014 at 09:00 hours (CET), and run until 15:00 hours (CET) on 7 October 2014, and the application period for the retail offering and the employee offering will commence on 23 September 2014 at 09:00 hours (CET) and run until 12:00 hours (CET) on 7 October 2014, both subject to shortening or extensions. In any event, it is expected that, the application period will be open at least until 2 October The final number of Offer Shares, and the final price per Offer Share, will be determined by EQT V and XXL, in consultation with the Joint Bookrunners, after completion of the book building period for the institutional offering. The pricing of the transaction is expected to take place on or around 8 October 2014 at 07:30 hours (CET) with conditional trading of the shares on the Oslo Stock Exchange to commence on or around 8 October 2014 at 09:00 hours (CET) under the ticker "XXL. 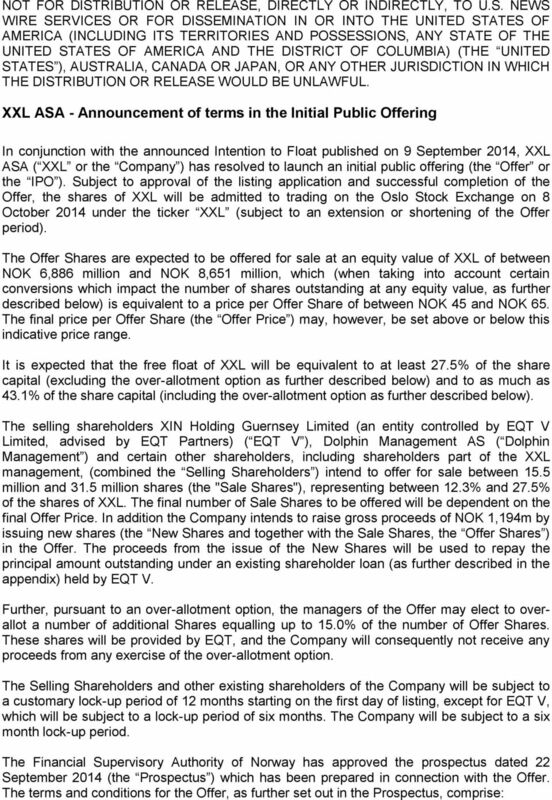 Completion of the Offer is conditional upon (i) the board of directors of the Oslo Stock Exchange approving the application for listing of the shares in the Company in its meeting to be held on 24 September 2014 and the satisfaction of the conditions for admission to trading set by the Oslo Stock Exchange, which are expected to be that (a) XXL will have in excess of 500 shareholders, each holding shares with a value of more than NOK 10,000, (b) there will be a minimum free float of the shares of 25% and (c) the completion of the conversion of existing share classes into ordinary shares and implementation of new articles of association of the Company, (ii) the Board of Directors of the Company resolving to issue the New Shares, (iii) XXL, EQT V and the Global Coordinators and Joint Bookrunners (as representatives of the Managers) having entered into the purchase agreement, (iv) satisfaction of the conditions precedent contained in the purchase agreement, and (v) the purchase agreement not having been terminated in accordance with its terms. There can be no assurance that these conditions will be satisfied. If the conditions are not satisfied, the Offering may be revoked or suspended. The Prospectus will, subject to regulatory restrictions in certain jurisdictions, be available at and from the commencement of the book-building period and the application period for the Offer, 23 September 2014 at 09:00 hours (CET). Hard copies of the prospectus may also be obtained free of charge from the same date by contacting the Company or one of the Managers. 4 with relevant persons. Persons distributing this communication must satisfy themselves that it is lawful to do so. Matters discussed in this announcement may constitute forward-looking statements. Forward-looking statements are statements that are not historical facts and may be identified by words such as "believe", "expect", "anticipate", strategy, "intends", "estimate", "will", "may", "continue", "should" and similar expressions. The forward-looking statements in this release are based upon various assumptions, many of which are based, in turn, upon further assumptions. Although the Company believes that these assumptions were reasonable when made, these assumptions are inherently subject to significant known and unknown risks, uncertainties, contingencies and other important factors which are difficult or impossible to predict and are beyond its control. Actual events may differ significantly from any anticipated development due to a number of factors, including without limitation, changes affecting the Company s opening of new stores and net sales, changes affecting the Company s gross margin, changes in competition levels, changes in the Company s ability to manage inventory levels, changes affecting net sales, such as variations caused by weather and seasonality, changes affecting personnel expenses and other operating expenses, such as premises costs and marketing costs, changes in laws and regulation and the potential impact of legal proceedings and actions. Such risks, uncertainties, contingencies and other important factors could cause actual events to differ materially from the expectations expressed or implied in this release by such forward-looking statements. The Company does not guarantee that the assumptions underlying the forward looking statements in this presentation are free from errors nor does it accept any responsibility for the future accuracy of the opinions expressed in this presentation or any obligation to update or revise the statements in this presentation to reflect subsequent events. You should not place undue reliance on the forward-looking statements in this document. The information, opinions and forward-looking statements contained in this announcement speak only as at its date, and are subject to change without notice. The Company does not undertake any obligation to review, update, confirm, or to release publicly any revisions to any forward looking statements to reflect events that occur or circumstances that arise in relation to the content of this announcement. The Managers are acting exclusively for the Company and the Selling Shareholders and no one else in connection with the Offer and assume no responsibility for this announcement. 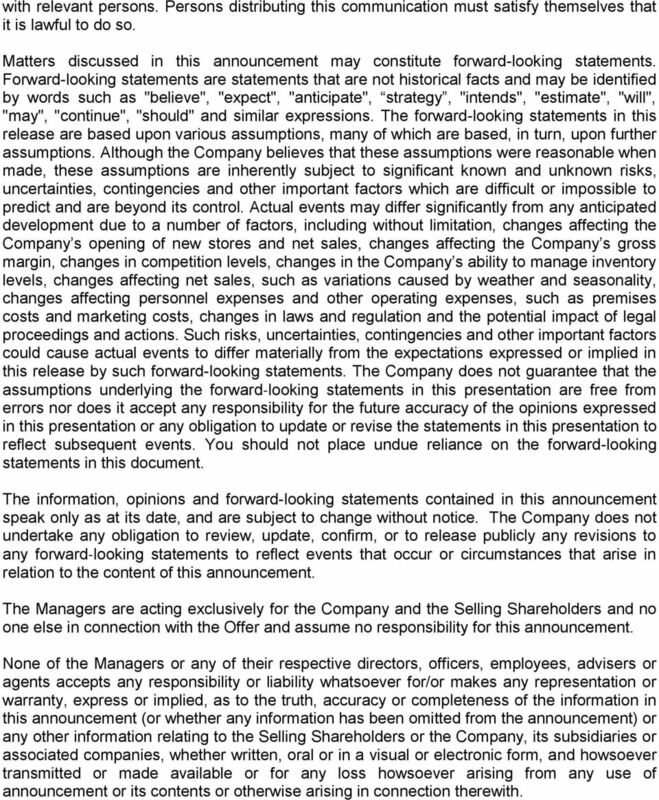 None of the Managers or any of their respective directors, officers, employees, advisers or agents accepts any responsibility or liability whatsoever for/or makes any representation or warranty, express or implied, as to the truth, accuracy or completeness of the information in this announcement (or whether any information has been omitted from the announcement) or any other information relating to the Selling Shareholders or the Company, its subsidiaries or associated companies, whether written, oral or in a visual or electronic form, and howsoever transmitted or made available or for any loss howsoever arising from any use of announcement or its contents or otherwise arising in connection therewith. Company Announcement. 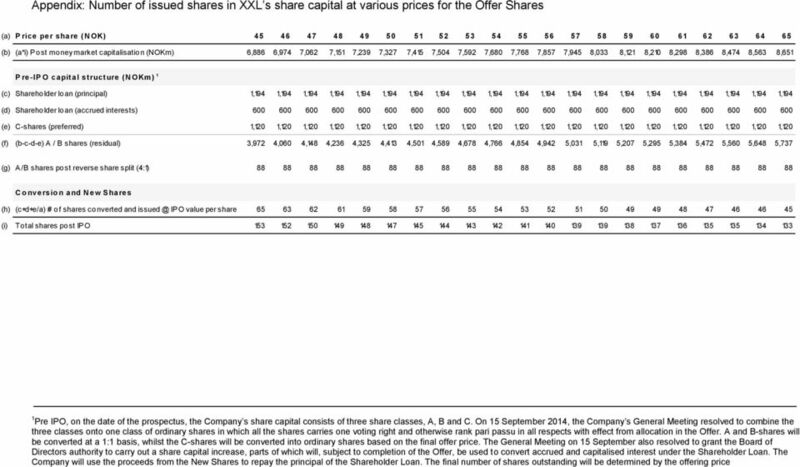 ISS publishes Offering Circular and sets indicative price range for its IPO. Copenhagen, 3 March 2014 No. NOT FOR RELEASE, PUBLICATION OR DISTRIBUTION IN, OR INTO, THE UNITED STATES, AUSTRALIA, CANADA, JAPAN OR SOUTH AFRICA. Securities Note. Austevoll Seafood ASA FRN Senior Unsecured Bond Issue 2015/2021 ISIN: NO Dated: 9 July 2015. The issue and settlement for the Bonds is expected to be on 3 August 2015. 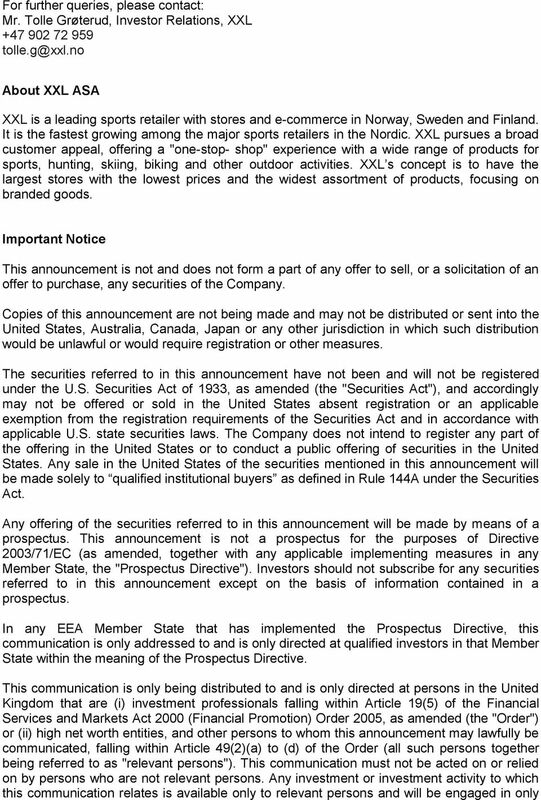 EUR 342 million Senior Unsecured Bonds due 2019 Convertible into Ordinary Shares of Acciona, S.A.
NOT FOR PUBLICATION, DISTRIBUTION OR RELEASE, DIRECTLY OR INDIRECTLY, IN OR INTO THE UNITED STATES, AUSTRALIA, CANADA, JAPAN OR SOUTH AFRICA. As the selling shareholder, Novo Nordisk A/S will receive all the net proceeds from the offering.